Last seen on 7th and 50th. 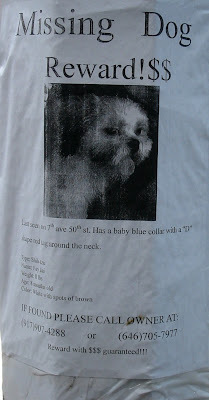 The dog wears a baby blue collar with a "D"
The numbers are on the poster. Click on the picture if you can't see it well. The owners of these pets should really look into a service called helpmefindmypet.com It a very proactive service that sends an alert poster out to all shelters, vets, rescues, municipalities and members in the area where the pet has gone missing. This program is pretty amazing because it works with or without the microchip.